NNAMDI KANU'S COURT CASE TODAY AT THE HIGH COURT ABUJA IS ABOUT WHAT IS CALLED PRIMA FACIE IN LAW. THIS SIMPLY MEANS THAT KANU'S LAWYERS ARE TELLING BINTA NYAKO THAT NIGERIA HAS NO EVIDENCE AGAINST HIM, THEREFORE HE IS INNOCENT OF ALL CHARGES! Again Kanu have argued convincingly that BUHARI does not know the meaning of Self Determination hence he is confusing it with attempt to secede from Nigeria. To the uneducated mind, both self determination and secession may appear to mean the same thing, but in Common Sense and LAW they are not. The court today 12 January 2017, is about exposing to the world what Buhari has been hiding from the public and that is the fact that Kanu has no case to answer. The term translates from Latin as, essentially, the case at first sight. As that phrase implies, it is a way to evaluate a case at an initial stage to see if there is any support for bringing it to trial. A party with the burden of proof, in this case Buhari's regime, presents a prima facie case when the party presents enough evidence to support a verdict in the party’s favor, assuming the opposing party does not rebut or disprove it. This means that the party with the burden of proof has shown that he or she can meet that burden as to each element of his or her case. Where a party with the burden of proof (Buhari appointed Prosecutors) cannot present a prima facie case against Kanu, his lawyers by law will apply for the charges to be dismissed because Buhari cannot possibly win the case. This is why Mogaji Labaran the Buhari prosecutor in the matter does not want Justice Binta Nyako to hear the application for the establishment of prima facie in the case against Kanu and the others. 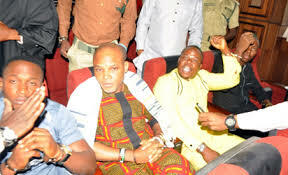 Because they Government of Nigeria knows there is not enough evidence to convict KANU and the others. That is why they opted for secret trial in order to tender incriminating evidence that cannot be challenged by this process. What today's court is about is that the prosecution i.e. 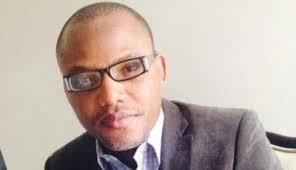 Buhari, has to present a prima facie case that Kanu is guilty of the crime charged. If Buhari cannot present evidence supporting each element of the crime they charged KANU with, then Binta Nyako must acquit him (even without having presented any evidence). For example, where a prosecutor has charged a defendant with burglary, the prosecution must present evidence that the defendant made an entry into premises without authorization. If the prosecution’s only evidence is that the defendant was found sometime after the burglary to be in possession of items stolen from the premises, that evidence alone will not support a burglary charge. The defendant would not have to offer any evidence but could request an acquittal based on the prosecution’s failure to make out a prima facie case of burglary. A prima facie case is an early screen for a court to determine whether the prosecution can go forward to try the defendant fully for the crime. As such, the standard of proof that the prosecution must satisfy at the prima facie case stage is lower than that for proof that the defendant is guilty. In order to establish a prima facie case, a prosecutor need only offer credible evidence in support of each element of a crime. By contrast, a prosecutor must prove defendant’s guilt as to each element beyond a reasonable doubt to win a conviction. So, even if a prosecutor can present enough evidence to establish a prima facie case as to all elements of a crime, the prosecution must nevertheless still prove defendant’s guilt beyond a reasonable doubt. This is a constitutional requirement. If a prosecutor cannot establish a prima facie case, that almost certainly means he did not have probable cause to support the arrest of the defendant. That, in turn, means that the charges would be dismissed even before getting to the stage of the prosecution offering her prima facie case. As a result, the prosecution in most criminal trials has no difficulty establishing a prima facie case because the defendant would have already been released otherwise. The defendant has the opportunity to offer evidence disputing each element of the crime that the prosecution has established in its prima facie case. And, the prosecution must prove each element beyond a reasonable doubt, so the defendant’s main goal is usually just to cast doubt upon the prosecution's proof. If the defendant succeeds in doing so, he should be acquitted. If a person charged with a crime can challenge the charge early and on the inadequacies of the prima facie case (or, better yet, the grounds for arrest), that person can save him- or herself time and money (and avoid a potential criminal penalty).